Vamvo projector screen is designed for easy setup, fast take down, lightweight to carry and compact to store it anywhere. √ Portable - The weight of the whole package is only around 6lbs which is less than half of the other portable projector screen. The package size is only 17.8"*6.7"*3.5" so you can put it in the car trunk. √ Stable - The tension of the front frame and the support of the back stand pole make the stable even after tolerable Impact. √ Easy - All the pipes are connected by an elastic rope. No need to find out how to match the pipes one by one. (Assembly steps are printed on the package.) It takes less than 5 minutes to assemble/take down without the use of tools. √ Adjustable - The width of the frame to hold the screen is adjustable with the rotating the joint so the screen could be flatter under tension. Besides, the screen tilt angle is adjustable by adjusting the height of the back multi-connector on the back stand pole with the locking handle. √ Warranty - 12 months warranty even covering parts. ♥Due to fold, the screen out of box might be wrinkle. Please iron it with low heat before use. ♥Please use the peg to fix the back stand pole if you set this projector screen on grassland. VERY EASY TO SET UP--It takes less than 3 minutes to fully set up the entire assembly. EXTREMELY STABLE-An unique and rigid support helps maintain so much stability that it would seem as if it were fixed on a wall. 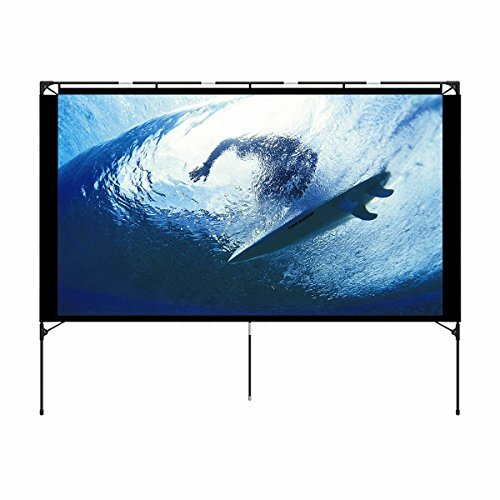 CONVENIENT TO CARRY-A foldable setup stand made out of special lightweight materials makes it the most convenient portable outdoor projection screen in existence. SIMPLE AND DURABLE-Our pipe and drape system combines simplicity with stability,designed to be portable in sedan cars! If you have any questions about this product by Vamvo, contact us by completing and submitting the form below. If you are looking for a specif part number, please include it with your message.